Gareth Southgate's men kicked their Euro 2020 qualifying campaign off perfectly at Wembley Stadium as they romped home to a 5-0 victory over the Czech's. England made a perfect start to Euro 2020 qualifying as Sterling’s hat-trick helped the Three Lions to three points and a comprehensive victory against Czech Republic. Gareth Southgate’s men started the game with dominance in possession with fullbacks Ben Chilwell and Kyle Walker pushed high up the pitch as Czech Republic sat with a deep defensive line. Southgate was forced into an early change as Eric Dier went down with an injury and was replaced by Ross Barkley when some may have been expecting Declan Rice to have been brought on early for his England debut. Czech had their first attack of the game after 23 minutes when they countered well from an England attack and played their way into a promising position, but Vladimir Darida fired his shot high and wide. For all of their possession, England had failed to break down the Czech Republic in the opening 24 minutes. But their patience was finally rewarded with a quick passing move as Kane slipped an intricate ball down the wing to Jadon Sancho who squared the ball across the box for Sterling who arrived at the back post as he has done so many times this season for Manchester City and put England in front. The front three of Kane, Sterling and Sancho continued to combine effectively throughout the half and caused the Czech’s problems as Borussia Dortmund winger Sancho showed his quick feet and skill on several occasions to beat his full back. England pushed for a second goal and were rewarded a penalty seconds before the break as Sterling tricked his way into the box and was impeded by two Czech defenders as he chased his touch. The ball looked as if would run comfortably into the goalkeeper’s arms, but the referee was given no choice but to award a penalty as Sterling’s path was blocked by two defenders to prevent him challenging the keeper. Kane struck his penalty firmly to Jiri Pavlenka’s right-hand side and despite the keeper getting a hand to the ball he could only push it further into the corner due to the ferocity of the strike from the England captain. Czech Republic responded promisingly at the start of the second half as they pushed players forward to try and get back into the game. Tomas Soucek met a curling cross and his diving header fell just wide of Jordan Pickford’s back post as the Czech’s started the half with some early pressure. David Pavelka then had two decent chances in quick succession as the ball fell kindly to him from a corner but his effort was palmed away by Pickford before his tame header was saved comfortably by the England number one just moments later. England began to regain control and some quick movement almost led to a third goal as Sterling and Alli combined with some neat first touch passing, and Jordan Henderson’s low cross was almost diverted into his own net by Novak but Pavlenka bailed him out with a smart reactionary save. The hosts produced another slick move when Sterling found Kane wide in the box and his lay off found Sancho who almost found his first England goal but his shot was blocked before the clearance deflected off Dele Alli and went inches over the bar. There was another mix up in defence for Czech Republic as a failed clearance deflected kindly into the path for Sterling who swivelled and curled the ball into the corner on his left foot beyond the goalkeepers reach. 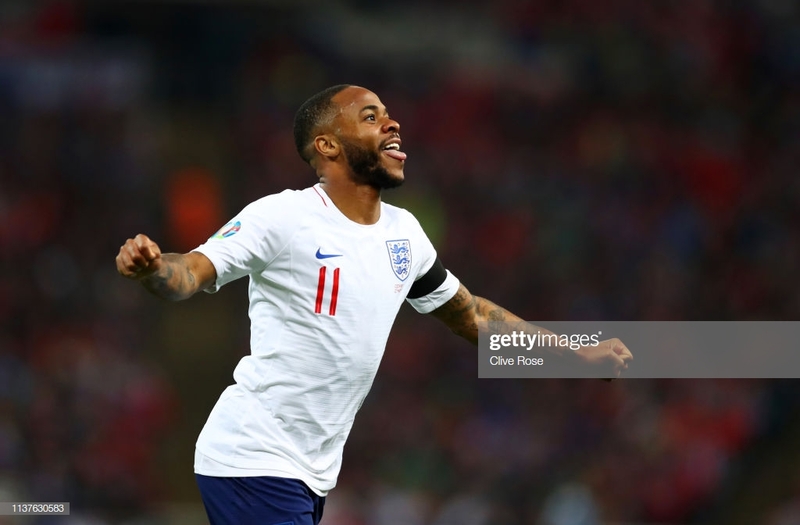 Sterling then sealed his first ever international hat-trick as he cut inside from the left-wing on to his right foot and curled an effort from distance which deflected off Ondrej Celustka and left a helpless Pavlenka watch on as the ball hit the centre of the net. England then received another slice of luck, this time with an own goal, as Sterling’s replacement Callum Hudson Odoi cut in from the wing and fired a testing effort which was palmed out by the keeper but Thomas Kalas failed to adjust his feet and clumsily shinned the ball in to his own net. England now travel to Montenegro as they try to extend their positive start to Euro 2020 qualifying on Monday evening having made a winning start to the campaign with a comprehensive victory against potentially Group A’s trickiest opponents tonight.